F. Scott Fitzgerald once observed that a novelist was an impossible subject for a biographer because if a novelist was any good, he was too many different people. He might have said the same of good playwrights. But there are exceptions to every rule. And when the playwright is the talented author of a one-woman show and the material is autobiographical, sometimes you can sit back and watch all those people come alive. So it is at Manhattan Theater Club's Stage 2, where Charlayne Woodard is presenting her touching and engrossing ''Neat,'' directed by Tazewell Thompson, through Feb. 9. Ms. Woodard, whose stage, television and film credits range from ''Ain't Misbehavin' '' to ''Roseanne'' and ''The Crucible,'' here displays her gifts as a storyteller, tracing her own early days and those of her somewhat older aunt, Neat. She brings to life not only assorted incarnations of herself, but also Neat, other family members and people like Charles Bowman, the oh-so-cool, sullen tough guy who chooses an awestruck Charlayne to be his girlfriend when she is in high school. 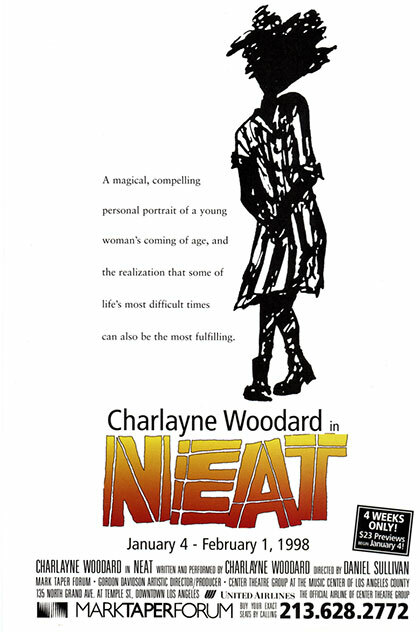 In addition, ''Neat,'' a companion piece to ''Pretty Fire,'' which Mr. Woodard presented here in 1993, is an excursion into sociology, from entrenched prejudice in the South to racial violence in the North, where Ms. Woodard grew up, with side trips into teen-age fashions, hairdos and pop music, family relations, friendship and religion. In the powerful, heartbreaking and beautiful tale that opens the evening, Ms. Woodard tells how the infant Neat's life was shaped by bigotry. In 1943, when she was 9 months old, Neat was poisoned by an illiterate great-grandmother unable to distinguish between two almost identical bottles. In convulsions but turned away by doctors at an all-white hospital in Savannah, Ga., she was saved by a black doctor, but too late to prevent brain damage. Switching between Savannah and her own home in Albany, N.Y., Ms. Woodard tracks her own growth, from the little girl who delighted in Neat's innocent playfulness to the older child a bit put off when the disheveled Neat arrives to take up life in Albany to the adolescent in search of black history and the high-schooler experiencing first love and Neat's mysterious pregnancy. Ms. Woodard sings, she dances, but most of all she tells good stories, bringing them to life in ways that are poignant or, in the case of Charles Bowman, sidesplitting. In memorable moments, the observant Ms. Woodard captures Charles's swaggering walk, the body language of children, the gingerly movements of the elderly Neat clutching her pocketbook with both hands and her ecstatic smile. If there is a tragic inevitability to Neat's life, then Ms. Woodard has built for her a fine and loving memorial. Written and performed by Charlayne Woodard; directed by Tazewell Thompson; sets by Donald Eastman; costumes by Jane Greenwood; lighting by Brian Nason; original music and sound by Fabian Obispo. Presented by Manhattan Theater Club; artistic director, Lynne Meadow; executive producer, Barry Grove; in association with Seattle Repertory Theater. At Manhattan Theater Club, Stage 2, City Center, 131 West 55th Street, Manhattan.